We’d love your help. 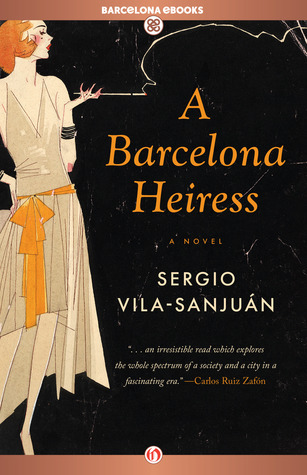 Let us know what’s wrong with this preview of A Barcelona Heiress by Sergio Vila-Sanjuán. A historical detective story set against the social and political tumult of 1920s Barcelona and based on the real events of the end of a dazzling era. In the decade before the Spanish Civil War, Barcelona is on the verge of boiling over. Pablo Vilar, a well-connected young lawyer and journalist, meets several mysterious people who seem to hold clues to what is brewing in t A historical detective story set against the social and political tumult of 1920s Barcelona and based on the real events of the end of a dazzling era. In the decade before the Spanish Civil War, Barcelona is on the verge of boiling over. Pablo Vilar, a well-connected young lawyer and journalist, meets several mysterious people who seem to hold clues to what is brewing in the city. The diverse cast of characters includes an assaulted cabaret artist, an anarchist leader, the city’s new autocratic civil governor, and a beautiful, wealthy countess—their destinies all bound by invisible ties. While the city both touches its zenith and peers into the abyss, Vilar guides us through a labyrinth that leads from the caverns of Montjuïc, home to paupers and outlaws, to the high-society parties in the gardens of Horta. To ask other readers questions about A Barcelona Heiress, please sign up. Into this the author introduces a protagonist based upon his own family's history, an indigent aristoc Sergio Vila-Sanjuan's A Barcelona Heiress has all the ingredients for a great novel, following in the tradition of early 20th century writers such as F. Scott Fitzgerald and John Steinbeck. There is the hotbed of political unrest during the Crown-supported dictatorship of General Miguel Primo de Rivera, anarchists bombing Barcelona, a growing discontent of the country's poor and working classes. Barcelona, Spain is on the verge of Civil War in the 1920s. The story of this multi-layered conflict is narrated by lawyer and journalist, Pablo Vilar. He's a man who in the name of both careers attempts neutrality in the conflicts but also a man who is constantly being swayed by partisan characters who want him to write articles favoring or defending one side against the other side. While he is not influenced that much, what he sees and hears is worthy of our attention, for it is the "stuff" of Barcelona, Spain is on the verge of Civil War in the 1920s. The story of this multi-layered conflict is narrated by lawyer and journalist, Pablo Vilar. He's a man who in the name of both careers attempts neutrality in the conflicts but also a man who is constantly being swayed by partisan characters who want him to write articles favoring or defending one side against the other side. While he is not influenced that much, what he sees and hears is worthy of our attention, for it is the "stuff" of which revolutions have been made for centuries. The eternal conflict between rich and poor is factually proven when Vilar is taken to the "caves" where the poor live and subsist on almost nothing or the private hospitals financially supported by those with a heart where starving, disease-ridden children are treated with the meager supplies of medicine and vitamins, food, etc. There are the union groups who are willing to incite and practice violence to obtain their demands. All of this is exemplified in the mystery which is the center of the story. It involves an anarchist who assassinates those who have committed crimes but been declared innocent by the courts. There's the heiress of the novel's title whom Vilar would wed but who continues to exert influence on both royalty, nobles, anarchists, union groups and the poor. She is a "woman for all people" and yet one wonders what principles center her real beliefs. And what about the cabaret singer who is brutally attacked and whose connections are less than innocent or neutral. One gets a fine sense of the culture of Barcelona and the governmental structure behind the story, involving royalty as well as city, military and provincial authorities. What Vilar hears in true political style is not what necessarily is! All is encountered during the most audacious and extravagant social parties and events. It is hard at times to follow the story because of all the name-dropping that no one could possible remember unless a master of Spanish history. An excellent read for those who love this great city. The tensions leading up to Franco's dictatorship are written clearly and in first person. The fact my late father in law, Dr. Francisco Merino, was born there and escaped Franco's police to settle in New York City, may have added a star for me. Sadly, we never got around to discuss his experience in any detail. Interesante novela sobre los años 20 en Barcelona. El protagonista es Pau Vilar, un abogado y periodista monárquico. Un día la artista de varietés Maria Nilo le pide que la defienda en un caso en que fue agredida por 3 hombres. A través de ella conoce al sindicalista Angel Lacalle, que le da a conocer una Barcelona lejana al ambiente burgués en que vive. I was totally without clue about this time period. It took me a bit to get into the story, but then I was hooked. Synopsis: In 1920's Spain, which is on the cusp of Civil War, the living differences between the rich and the poor are glaring and those with their own agendas are manipulating the system. Simmering beneath the surface is someone murdering individuals whom have been found innocent of their crimes by the courts. Narrated from the perspective of Pablo Vilar, an attorney and journalist, who is always being manipulated from the interest groups wanting their own stories told, and loves an heiress, who seems to be able to mix with all these groups flawlessly. Is the heiress all she seems to be or is there something much deeper under the surface. My opinion: Although the premise of the story was interesting to me and the description of the setting was superb, I couldn't connect to any of the characters and found them to be written very one dimensionally. As a result, this book simply fell flat to me. I wish the author would have put as much effort into character development as he did into developing and describing his setting. I think had he done that, this would have been a 4 star read for me. I really liked the setting. I thought the high society and gritty underworld worked well together. That mixture really highlighted the mystery and added a great contrast to the era. I am not very familiar with Spanish history or social structure during this era and I thought some of the facts were a little lost on me. There were a lot of references to predominant figures in Spain during this era and I found myself struggling to remember who was who and what their function was. I think I would ha I really liked the setting. I thought the high society and gritty underworld worked well together. That mixture really highlighted the mystery and added a great contrast to the era. The author assumes the readers' familiarity with the subject matter as a given. Had the author provided a short background to this story, then the fictional narrative would have made more sense. As it was, the execution was lacking as there was no real connection between narratives - it comes off as a disjointed attempt to recreate the glitz and glamour of the Gatsby era with the setting in Barcelona. For someone who knows Spanish political history, this book would be interesting background, I think. Also of interest to those who know Barcelona and its society well. It reads like an old detective story from the 1930's, so kind of fun in that way.